Rational discussion of the future of work is threatened by popularization of the term Artificial Intelligence. We need a new, more accurate phrase, that doesn’t conjure up images of sentient robots, but describes the statistical tools we use today to make complex decisions. We haven’t created “Artificial Intelligence”. We have built “decision machines”. General AI has a potent association with the term “Artificial Intelligence”. When we hear the phrase, it feels like General AI is around the corner. In fact, we have no idea whether or when it will happen. Furthermore, the software tools called “AI” today are not the first step towards General AI. They are new tools in and of themselves. “Artificial Intelligence” should only refer to “General AI”, not the real software tools we are building today. To illustrate these concepts, let’s examine the Narrow AI software inside a “smart” thermostat for your home. First, the software inside the thermostat makes a decision: whether to turn your heater on or off. The software is programmed to make this decision over and over again, every hour, or every minute of the day. Next, the Narrow AI tries to make the “best” decision within limits defined by its human creators and users. Let’s say the “best” heating decision uses the least amount of energy, and has no more than two manual adjustments per day. If the software turns off the heat too much, users will turn up the heat manually. However, leaving the heater on too long wastes energy. The Narrow AI makes the “best” decision by adjusting the heat over time to minimize manual adjustments and energy use. Third, the software collects data about your home’s temperature, energy use, and how often you change the temperature manually. The software uses these variables to determine the probability that turning the heater on is the “best” decision. Finally, the system “learns” by calculating the probability a decision is “good”, and adjusting over time. For example, imagine the software estimates a 95% probability that you won’t interfere if it turns off the heater at 7PM. However, five days in a row you turn up the temperature at 7PM. On day six, the software will now estimate say, a 5% chance that you won’t interfere. It has “learned” what to do at 7PM and makes a decision to leave the heat on instead. Narrow AI’s “learn” constantly by comparing their estimate of the probability that something will happen, with the actual number of times something happened. Smart thermostats, like all other Narrow AI tools, are not a new and novel type of intelligence. Narrow AI tools are really just decision machines created by humans to make decisions rapidly and repeatedly. There is no “intent” behind the actions of a decision machine, only a human creator who intends to make their life better by having a tool to make repetitive decisions. There is no “independence” of thought, only calculations of probabilities over and over to make a decision with the highest probability of being “good”. There is no “self-actualization”, only a human that pushes the start button. There is no “will”, only electricity powering the software until a human pulls the plug. If we use the term “Artificial Intelligence”, we inaccurately imply that a new form of intelligence actually exists, and will eventually become a General AI by becoming “more intelligent” over time. On the contrary, decision machines only get better at one thing…making the decision they were programmed to make! As with all machines, they will get better and faster over time. However, they will not, suddenly, transform into General AI. Decision machines help humans, they don’t replace them. Imagine the human alternative to the example above: to compete with the thermostat decision machine, you would have check the weather online, the temperature in your house, and stand near the thermostat all day to make manual adjustments. It’s not that it is impossible for you to do this job. It’s that the job is so boring and monotonous that you would never do it! Decision machines are a powerful invention. They follow on the heels of other human inventions like mechanical machines to move objects, and silicon machines to store information. There are thousands of decisions that people make every day that a decision machine can help with. Today, decision machines are helping doctors to examine medical images to ensure human doctors don’t miss critical information. Tomorrow, decision machines may help us drive cars, by making decisions about the speed and distance our vehicle should travel in relation to other cars. We should all want a future where we own and control these powerful tools to help us make better decisions. But, we need to stop calling them “Artificial Intelligence”. We are not heading towards a world of sentient robots. We are headed towards a world where machines help us make decisions, rapidly, and repeatedly, using the latest data available. Let’s call these powerful tools decision machines. The challenge is simple: calculate the Return on Investment (ROI) for a specific major at a specific school. Is it possible? Return on Investment (ROI) is a one of the most basic concepts in corporate finance. It requires that you understand the costs and future benefits of investing money in a certain piece of equipment or project. This is necessary because (unless you’re Apple or Google) capital is scarce, and you can’t do everything. You have to prioritize. Similarly, American students are trying to pursue a higher education, while balancing personal and family finances, their personal interests in a field of study, and the economic realities of the job market upon graduation. (Not to even mention the rank, campus, geography, and size of a school). Estimating the ROI for a particular educational pathway is obviously just as important as visiting the campus or performing online research. This, is the Investment (I) in ROI. This is the first number you need to estimate the economic return to that education. This is the second number you need to estimate the economic return, because it allows you to see the change in earnings due to education. If you are a first time 18 year old student, this number is probably just the average high school earnings in the geography of the college. If you’re an adult learner, however, it might be the average of your peer group prior to matriculation. With this basic information, you could calculate the ROI, the rate of that return (internal rate of return, or IRR), and the payback period in years. Needless to say, I could not find any such resource. Yes, we can fly rockets into space and then have them land themselves, but we can’t yet quickly figure out the ROI to graduate in English or Economics from State U or Ivy U. Instead, I found a smattering of resources that provide some parts, but never all the parts, of the ROI equation. NACE produces a report every year called “First Destination Survey“. This survey of over 350 schools, is the best report I’ve found that highlights earnings based on college major. This report includes the completely unsurprising statistic that average starting salaries for Computer Science graduates is ~$72,000 vs. Communications graduates at ~$34,000. (Consider the latter in light of the fact that the median earnings for high school graduates in the U.S. is ~$32,000.) The downside is that you can’t see this data by school, it doesn’t have an estimate of student salaries before attending college, and the report doesn’t focus on education costs at all. The U.S. DOE provides data on average costs of enrollment and average salaries upon graduation for over 3,800 schools across the country. This data set wins brownie points for scope, however, fails to provide detailed data by major. Given the range of graduation salaries shown by NACE, this seems like an incredible oversight. Furthermore, there is again, no data on salaries of students prior to graduation, which is particularly relevant for adult learners. The California Community Colleges has an app called the Salary Surfer, which allows you to see the median annual salary for Community College graduates, 2 years before, 2 years after, and 5 years after graduation. This data is thanks to the fact that the California Community Colleges has a connection to the California Employment Development Department, which processes certain payroll withholdings in California. This means the salary data is not based on unreliable student surveys, but actual matches of a students social security number to their actual payroll withholdings. At the end of the day, it’s clear that if a student or their parents wants to calculate the ROI of a specific degree at a specific college, you are going to have to do the research yourself and put together your own financial models. Something, no doubt, very few families or students bother to do. We can, and should do better. The data exists, and it’s merely a question of finding a way to get it out in the open. The American Dream is under attack by the forces of wage stagnation. Former Google CEO, Eric Schmidt, has emerged as a champion of new ideas to help American workers fight back. The American Dream is simple: pursue Life, Liberty, and Happiness through hard work and determination. It lives on thanks to the many stories of hard working Americans that have achieved the American Dream. However, American workers face an economic enemy: wage stagnation. In 2018 dollars, average hourly wages in the U.S. have barely increased in over 40 years, despite the fact that over the same time period, the percentage of Americans with college degrees has increased from less than 10% to over 30%. First, the foundation has created an Alliance for the American Dream with four public universities: ASU, Ohio State, and the Universities of Wisconsin and Utah. The goal of the Alliance is to generate new ideas to increase net income for 10,000 residents of their communities by 10% by 2020. These initiatives are funded with $1.5M grants and will support idea competitions directly tied to fighting wage stagnation in these states. Second, Schmidt Futures has partnered with Jobs For the Future (JFF), a Boston-based non-profit, to launch the $1 Billion Wage Gain Challenge. This is a national competition, looking for novel ideas to add $10,000 in annual income for 100,000 low and middle-income workers by 2021. Through these initiatives, Americans will have a chance to contribute new ideas to combat wage stagnation. However, any solution will face a number of powerful forces that have been depressing wages for the last 50 years. Wage stagnation is not caused by one thing only, but by a powerful group of economic forces that have aligned against American workers. These adversaries combine together in different ways depending on the industry, location, and nature of the work. Historically, workers have joined together in unions to solve the collective action problem and increase their bargaining power relative to employers, enabling workers to command higher wages and benefits. Today, union membership is less than a third of what is was following WWII. Workers who sign a non-disclosure or non-compete agreement reduce competition for their talent and are prevented from taking competing job offers. Similarly, companies colluding or cajoling other companies to not “poach” workers, help to keep wages lower. Some studies have suggested that States that do not enforce non-compete agreements have higher wages, because of increased competition for employees. The Federal minimum wage has not kept pace with worker productivity (amount of goods produced by the same number of workers), or even average wage growth over the last several decades. Globalization has resulted in a shift of manufacturing capacity from the U.S. to other countries, especially China and Mexico. Wage competition from these countries has hence kept wages lower in the U.S. Automation is the process of taking certain tasks performed by workers and having these tasks performed by machines or software. From an employer perspective, if you can “de-skill” a job by automating the more complex parts of the work, you can hire a less expensive worker with lower skills. Increasingly, some studies have shown that workers who have entered the workforce most recently have experienced workforce automation that results in a reduction in their pay or hours worked. As we saw above, worker productivity has been steadily increasing, however the rate of worker productivity is declining. In other words, we are not learning how to produce more goods for the same amount of workers as quickly as we used to. This trend contributes to what economist Tyler Cowen similarly calls the “Great Stagnation”. 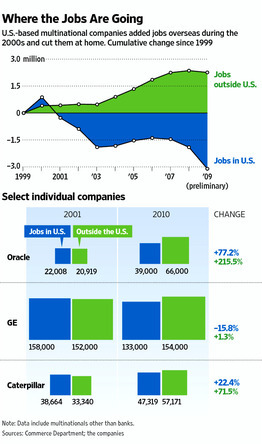 Outsourcing is the trend of American companies shifting their workforce to countries outside the U.S. This implicit threat to U.S. workers of having their job within the same company shifted to another country, helps to suppress wages. Workers are less inclined to move from one employer to another or one state to another. This makes it more likely that an employer can pay lower wages since workers are less inclined to move in search of higher wages in a different part of the country. Taken together, these forces have clearly had a negative impact on wages. On the other hand, identifying these forces has little prescriptive power at the individual level for fighting the battle. For example, telling a worker to “form a union” or “be willing to move to a different state” are not enough. Wage stagnation boils down to a specific question: how can a single worker, with no ability to impact the macro-economic trends above, move the needle in their own life, for their own families? Answering this question is the purpose of the Wage Gain Challenge. In order to move the needle, we have to identify strategies that can increase the annual, net earnings of a worker by $10,000 a year, in 2 years time or less, either by reducing their out of pocket costs by $10,000 pear year, or increasing their post-tax income by $10,000 a year. Here are two possible ideas to accomplish this goal for at least 100,000 workers. Idea 1: Help 100,000 non-working American men, start working again. There are 7 million men who are between the ages of 25 and 55 in the U.S. who don’t work. That’s 7 million soccer coaches, firefighters and salesmen who could be out there hustling that are sitting out the game. If we could get any of these men to return to work, even at a minimum wage job, we could meet the goals of the challenge. One possible angle would be to focus on interventions that help men to get healthy and pain-free. A study showed that half of prime-age men are taking daily pain-medication, the bulk of which is prescription pain medication. Similarly, over 40% of these men self-reported themselves as being in “poor health” compared with only 12% of men with jobs. Imagine, for example, a partnership between the Salvation Army and Crossfit, whereby chronically unemployed men could receive free memberships to fitness classes? Could one year of classes, for around $1,500 in cost, rekindle these men’s potential and help them get off of pain medication and back to work? Solution 2: Get Americans with “some” college courses under their belt to complete their Associates degree. A recent study showed that the average increase in annual income for Associates degree holders 5-9 years after entering school was an average of $7,160 per year. Fascinatingly, the average increase for liberal arts degrees are small compared with completing technical degrees (e.g in healthcare). Average data for STEM associates degrees was not available, but one study found income gains for technical degrees to be 30% higher. By focusing on STEM associates degrees, a $10,000 gain in annual income post-graduation should be possible. Imagine a national effort, organized by Community Colleges across the country, to contact former students in STEM fields and offer them financing with Income Share Agreements to complete their studies? Every American can help solve the problem by participating in the Wage Gain Challenge. You can stay updated on the competition here. The competition starts on September 24th and finalists will be announced in December. I’ll also continue to look for other novel ways that companies, non-profits, startups and government are tackling wage stagnation. Don’t count out American workers yet.